Live exports of Australian Alpacas are conducted by Australian livestock exporters licensed by the Australian Government and the industry is highly regulated and has high levels of compliance. Animal Welfare is a primary component of the compliance and a primary focus of the way in which we conduct our business. Alpacas are actually members of the Camelid family and originate from across between the lama and the vicuna some 7000 years ago in Peru. Peruvian people clothed their nob leman and royalty in multi-coloured garments made from the fabulous fleece of these wonderful animals. A thousand years before the Roman Empire, a thriving economy existed, based on selective breeding and the production of alpacas that are thought to have had even better fleeces than the finest alpacas today. The breed was decimated during the Spanish conquest, the Spanish seeing the alpaca as a competitor to their sheep for grazing pasture. In modern times in 1950 Victorian sheep farmer imported the first alpacas into Australia. There are now 130,000 registered Australian Alpacas and the industry is predicted by 2020 to have 1 million animals. 90% are the Huacaya breed and the rest are the Suri breed. The fleece of the Huacaya is more like wool and the Suri dreadlock like, both are highly sought after and attract high prices, white being the preferred colour. Suris are better suited to hotter and more tropical climates with the fleece parting along the topline of the back allowing them to cool off in hotter weather. There are 22 official colours for alpacas, with white being the most prized by the fashion industry. The fibre is luxurious and very comfortable to wear. 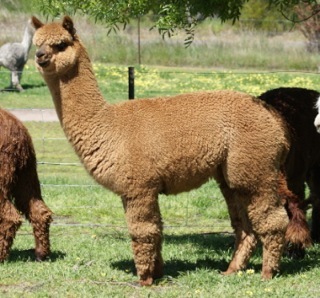 There are about 2000 breeders of alpacas in Australia and quality breeding stock is always available. Alpacas are gentle and easily domesticated and quite easy to care for. Export markets for Australian alpacas include China, New Zealand, Europe and Asia.